Our ongoing teacher diversity series has, to this point, focused on the underrepresentation of racial and ethnic groups among the public teacher workforce in America. As best we can tell, the lack of teacher diversity is associated with an assortment of negative outcomes for minority students. These findings raise another important question: If we worry about racial/ethnic underrepresentation among teachers, should we also care about gender underrepresentation? The difference in gender representation—75 percent female teachers for a student body that is evenly split by gender—is nearly as large as the gap in race and ethnicity (roughly 80 percent white teachers for a student body that is roughly 50 percent white). Might teacher gender be contributing to the growing gap favoring females in college graduation? In this post, we examine the evidence on gender gaps and discuss three ways gender mismatch between teachers and students may play out in K-12 classrooms. Our conclusion: It is not clear that the plethora of females in the teacher workforce is worrisome in most circumstances—more female teachers may even be preferred in math and science classrooms. Targeting male teachers of color is the only place where there could be strong enough rationale to warrant recruiting more males into the profession, though it is not clear recruitment efforts alone would be enough to make much of a difference. Hence, we argue promoting gender diversity in the workforce does not warrant equal priority to that given racial and ethnic diversity. The rise of women’s status in industrialized countries around the world in recent decades is unmistakable. Meanwhile, a counter-narrative laments the dwindling status of men relative to women, decrying that the overwhelmingly feminine K-12 teacher workforce creates the conditions for a “war against boys.” This story has been around for nearly two decades, drawing attention in some parenting corners, and has seen a bit of a resurgence in the new era of Trump and gendered politics. Simply put, this idea alleges that the female-dominated teacher workforce imposes norms of learning and behavior on all students that are developmentally appropriate for girls but implicitly disadvantage boys. This is essentially a parallel argument to the ways ethnic and racial mismatch between students and teachers could undermine educational achievement for students of color through implicit bias. Yet, we need to be clear that any analysis of gender achievement gaps is inherently different from the analysis of racial/ethnic achievement gaps. The key difference is that girls and boys are about equally distributed across all different types of schools and communities, while this is not the case for racial and ethnic minorities. Consequently, any opportunities to differentiate based on gender must happen in subtle ways that are not dependent on different geographies or physical facilities, which is often a primary cause of racial/ethnic inequalities. Beyond this theoretical difference, when we look at the numbers, are boys actually losing ground on girls in the U.S.? Though the argument of women outperforming males seems compelling when looking at some outcomes—particularly college graduation rates—we do not see evidence that is nearly so persuasive across other educational outcomes. Take the recent results from the National Assessment for Educational Progress (NAEP), for example, where boys are slightly ahead of girls in math in both 4th and 8th grades. Boys continue to lag in reading, but they have actually made steps toward narrowing their performance gaps in comparison to the mid-1990s in both grades. Combining the NAEP’s reading and math scores by grade and tracking them over time, as shown in the figure below, girls do have the upper hand by a small margin that has slightly narrowed since 2003. 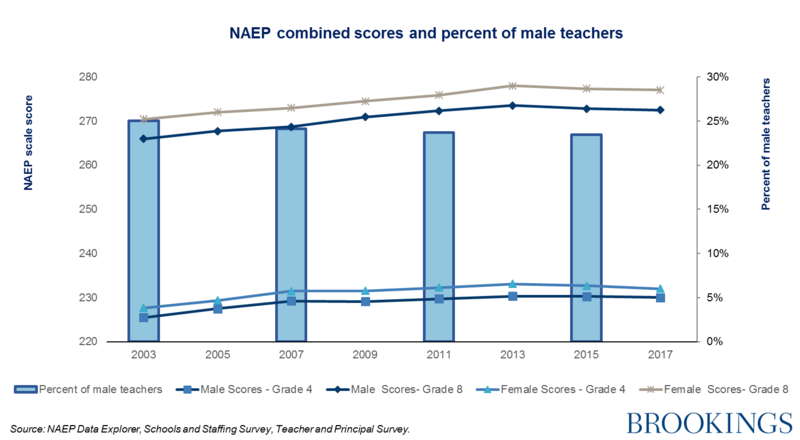 The performance of both genders during elementary and early secondary grades is actually increasing over time, while the share of male teachers in the workforce declined by about 2 percentage points (see the bars in the figure below). In fact, the teaching profession has slowly become more female over several decades. According to the most recent data, women constituted 76.3 percent of the workforce, compared to 70.5 percent 30 years ago. Though this percentage change may seem trivial, these are big numbers: We would need nearly 200,000 more male teachers today to return to the gender balance the workforce had in 1988. Importantly, these gender-based achievement gaps are also notably smaller in kindergarten, in comparison to known racial/ethnic gaps. These gaps also shift during kids’ grade progression without consistently advantaging either gender; for example, boys tend to outperform girls more in math during elementary years, while girls consistently outperform boys in reading. Also, math gender gaps are sensitive to socio-economic conditions, though reading gaps are not. It is also worth noting that gender performance gaps are prevalent across the world. Boys in the United States actually perform quite favorably, relative to their female peers, in comparison to other countries. Though far more factors go into these scores than the share of male teachers in the workforce, the pattern of observed results where boys are still doing all right as the workforce becomes more feminine runs contrary to the “war against boys” hypothesis. More to the point, evidence based on classrooms with male teachers compared to female teachers have shown mixed results on whether teacher gender impacts student learning. If anything, teacher expectations (at least in math) appear to advantage boys over girls, where teachers systematically underrate girls’ abilities unless they demonstrate hard work. Female teachers also appear to have the best relationships with all students, regardless of gender. Hence, it is unclear that promoting more gender diversity among all teachers would do anything to improve boys’ school performance. Should we actually be hiring more female teachers in STEM subjects? As we mentioned above, the one educational outcome where females hold a clear edge over males is in college attendance and graduation. Yet, it is not clear that this is the result of a disproportionately female K-12 workforce landing them there. Rather, it appears that women need to succeed in school to have a decent shot at middle-class earning power, where many men can earn equal wages with fewer years in higher ed. Evidence suggests that much of the reason why women persist in higher education longer than men is likely because of the higher returns to education that women receive, roughly double those earned by men. Further, in spite of the larger number of female graduates, college-going women typically major in relatively low-paying fields, such as social work and education. Consequently, for this and other reasons (like childrearing and discrimination), the gender pay and wealth gaps that arise after graduating college still overwhelmingly favor men. Seen through this lens, where boys ultimately triumph in the workforce despite lagging in the classroom, it’s reasonable to interrogate the idea of developing a K-12 strategy that may ultimately reinforce those inequalities in the long run. In fact, it may be the girls who actually need the help, and STEM fields are an area that appear to hold the most leverage for reversing those workforce trends. For quite some time, we have known of a role modeling link between female professors in STEM subjects and women undergraduates—the best evidence available shows this is a causal relationship that results in higher grades and persistence for the women undergraduates. Might this also be true in K-12? A couple of studies in recent years suggest the answer is yes, while finding no evidence that female teachers harms boys’ interest in pursuing STEM fields. In other words, having more women leading math and science K-12 classrooms could actually be a preferred strategy to promote more gender equity in workforce outcomes. Based on the most recent data from the 2015-16 National Teacher and Principal Survey (NTPS), secondary teachers in math and science are already 65 and 62 percent female, respectively. Interestingly, these numbers are not the same across the country. 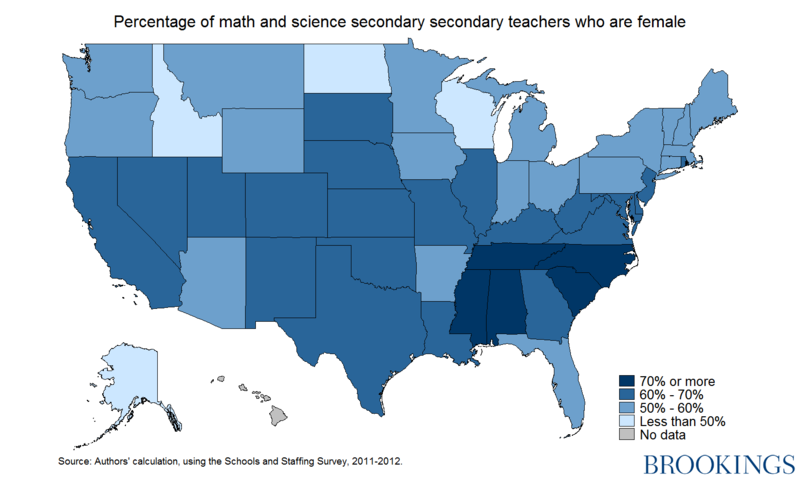 Rather, as shown in the map below, many states in the South have relatively high shares of female math and science teachers, while the tech-focused Washington state has few. (The map uses data from the Schools and Staffing Survey to calculate the percent of female math and science teachers because the NTPS is not representative at the state-level; additionally, states with fewer than 30 survey respondents are withheld.) These results suggest some geographical areas may benefit from more female teachers in STEM subjects. Returning once again to the boy-girl gap in test scores, the demographic group that does suffer from a clear gender-based disadvantage is boys who are raised in households with low socio-economic status. Evidence from 1 million birth and student records in Florida suggests being raised in disadvantaged conditions (which includes a disproportionate share of racial/ethnic minority groups) has particularly bad impacts on boys—far more than on girls. Black boys are particularly set back by these circumstances. This finding aligns with recent evidence from the Equality of Opportunity Project, which finds black boys lag far behind white boys on their likelihood of upward social mobility and a number of other dimensions, while almost no gap exists between white and black girls. Among the teacher workforce, there is a growing chorus of policymakers and practitioners looking to recruit more minority, male teachers into the profession on the belief that doing so will provide critical support for a high-risk population of students. Though we are unaware of any empirical evidence that male teachers of color have any different impact on students (beyond that already documented by virtue of racial matching), there is some suggestive evidence that they could likely help. The Equality of Opportunity Project’s results pointed to a lack of father figures as a likely factor to low social mobility, and male teachers of color could arguably help fill that role in socio-economically disadvantage communities. Also, many stakeholders agree that teachers can provide role models and cultural bridges for students of color, even contributing to a sense of belonging in the academic sphere. Thus, promoting the hiring of male teachers of color could represent one way of targeting the needs of minority male students. Men of color are acutely underrepresented in the teacher workforce. Black male teachers and Hispanic male teachers each account for roughly 2 percent of the K-12 workforce overall. 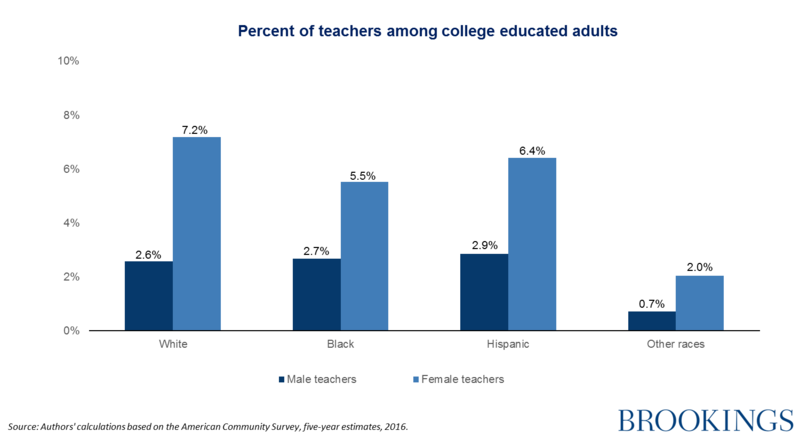 Yet, our analysis of data from the American Community Survey suggests that convincing minority male college students to enter the teaching workforce is not the reason for their underrepresentation. In fact, roughly equal proportions of white, black and Hispanic male college graduates report working as public school teachers (see the dark blue bars in the figure below). Compare this against the patterns among females (the light blue bars). In general, we see all college-educated females—regardless of race/ethnicity—are more likely than their male counterparts to enter teaching. Yet, white females are considerably more likely to be a teacher than college-educated females in other racial/ethnic groups. What this suggests is that the largest contributor to the low representation of male teachers of color is low college-going and graduation among minority males overall, not a failure to convince members of these groups to choose teaching over other professions. Should we prioritize more gender balance among teachers? By this point in the discussion, it should be clear that the relationship between student and teacher gender is complex and plays out differently than those based on racial and ethnic characteristics. After reviewing all of the evidence, it is not clear that boys in general are at a systematic disadvantage because of the predominantly female teacher workforce. Despite the resurgence of the war on boys narrative, there is no reason to think that a female-dominated teacher workforce is problematic. Any efforts focused on teacher workforce related to gender may instead focus their efforts in a more productive way, perhaps through increasing the share of female STEM teachers and minority male teachers. However, we hasten to note that the evidence on whether these strategies would improve student outcomes is fairly thin. Given the negative impacts of the lack of racial diversity in the teacher workforce that we have discussed in these series (and the strength of evidence supporting that), our recommendation is to prioritize a focus on addressing those gaps rather than the gender representation gap. Maximiliano Rombado and Bethany Kirkpatrick contributed to this post.